Battery operated heated shoe insole. 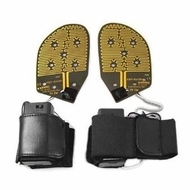 Thin shoe insoles fit right inside any shoe or boot and heat up keeping feet & toes warm. Convenient leg strap holds AA batteries and has a remote cord to disconnect power when not in use. Designed originally for military use. One size fits all. maintains body temperature of feet.